A new trend has begun showing up in sixth grade. Many of my students have been showing up with eReaders. It’s not surprising. The price of entry-level readers has gone well below $100, even for name brand readers such as the Kindle or the Nook. With prices this low, most parents seem happy to give a reader as a birthday or Christmas present. I, for one, am excited about this development. A student can carry dozens of books with him or her and read them at leisure. But there is also another benefit. In a recent study by Pew Research, it has been shown that the average person owning an eReader reads 24 books per year compared to 15 by the rest of us. This is good news for the publishing industry, since eBooks are cheaper to produce and distribute than paper books. To me, it is all irrelevant when compared to what I see in my classroom: kids reading who did not read before. Maybe it is the novelty of the medium; maybe a time will come when eReaders are considered boring and turn into the 8-track of literature. I think it has something to do with the convenience factor, that from that simple device they can pull up what they want to read when they want to read it. For those of you who live near a well-stocked library or a giant book store, that might not seem important. But for my students, living in a rural setting, acquiring things to read is harder and the ability to read something at the push of a button makes that first step a lot smaller. As a teacher, I hope to see more of these devices, not just for reading, but also a wider move to a ‘bring your own device’ policy, where we welcome more electronics into the classroom just as we would books, notebooks, and pencils, treating them not as novelties (though they may be filled with novels) but as vital and useful tools for learning. Wisconsin is a potluck culture. You don’t go anywhere without bringing something to share. Partly because we are a generous people by nature and partly because you can be sure there will be something you like to eat. I grew up near the bratwurst capital of the United States and I married a person who does not eat red meat. I know this to be true. I think BYOD is a great idea for a several reasons. Students are less likely to damage their own property than the schools. I have seen too many of my students mishandling laptops and cameras and thinking nothing of it. If it was their precious iPod at risk, the one that they begged and pleaded for weeks to get, I doubt they would be juggling it down the hallway. It puts the pressure off the school to provide everything. I am all for giving students the tools they need, but wouldn’t it be nice if students were pumped about getting the latest Office suite? A group of my kids were pumped because they downloaded the Edmodo app on their iPods and were able to do their homework at home. It frees up resources for where they are needed. Rather than spending time creating an eReader policy, learning how to lock down and administrate the eReaders, and creating accounts for the eReaders—the kids can do that! Then, with setup out of the way, teachers and administrators can focus on teaching students how to use their devices better rather than getting them working and keeping them working. However, there are issues that could easily pop up. Acceptable use is an issue. If students are bringing their iPads to school, who is to say they are doing schoolwork and not just playing games or texting their friends? First, there are filters that can block most distracting and inappropriate communication. But no filter that I know of can beat a teacher being aware of what is going on in their classroom and being given the freedom to make judgment calls. Access for students needs to be universal. Sure, it is a parent’s job to provide what a child needs, but I have yet to visit one school that does not have a closet full of hats, gloves, notebooks, backpacks, pencil, and even Halloween costumes for kids who need them. Because, at the end of the day, it is the school’s job to make sure that everyone gets the opportunity to learn. Will schools have to buy some Kindles to act as loaners? Sure. But I think many schools would be surprised to see just how far parents will go when they are asked to step up. I would wager that schools would be loaning out fewer than they think, and that come the holidays, their kids won’t be asking for a Gameboy. For more information on BYOD check out a great article The 7 Myths About BYOD Debunked by Lisa Nielsen. Well, the tablet market is in an uproar this week because of the release of Amazon.com’s Kindle Fire. The Kindle is the most popular e-reader on the market, mostly because it is fairly inexpensive and does its primary job—reading books—very, very well. But little has changed with the Kindle since its release and now, with the Kindle Fire, a fully functional Android tablet may work its way into schools looking for simple mobile technology priced under that the iPad. 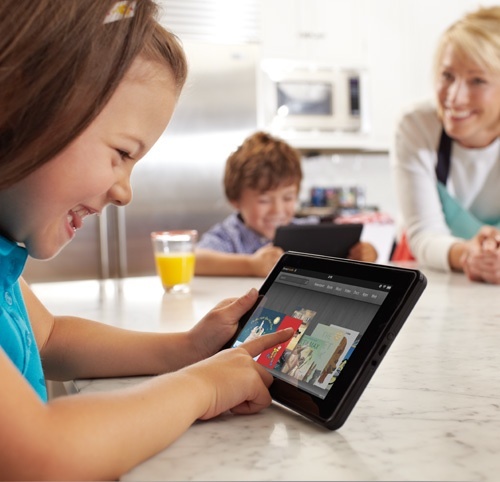 What is the Kindle Fire? Well, it has given up the e-ink screen that the original Kindle had for a standard LCD, which means it has great color but poor battery life. Well, poor compared to the original Kindle, which could go for a month or more between charges. The Kindle Fire has to settle for 8 hours, long enough to last the whole school day if you never shut it off, 2-3 days if you are like me and put the little fella to sleep now and then. As for other features? Well, it does play apps, but the apps are not there yet. The Fire is new and quality apps that work with it will take some time to appear. It does feature a great browser, however, that actually uses massive servers on the cloud to pre-load your Internet content, so it’s fast. And the Internet will be enabled with Flash—blessed Flash—which has been missing on any i-device. The Fire also has a 7-inch screen, something that seems a little small to an iPad owner like me, but would work just fine for students. In fact, it might be better suited to little hands than 10-inch tablets. And that brings me to the best thing about the Kindle Fire. It is priced at $200. For the price of a pair of Air Jordan sneakers, a student could have his or her very own web-enabled tablet, one you won’t mind handing over. And with the legendary, (nearly) crack-proof gorilla-glass screen, the Fire should hold up well to bumps and bruises. But there are other things to take into account. For one thing, the Fire does not have a camera or a microphone. Neither of these things seem important, but if you are in the mood to create multimedia as well as view it, the Fire might not be your best choice. And if you are looking for a straight up e-reader, the new flavors of the Kindle will make it even more affordable for schools, with models now under $100 that come complete with touch-screens. Would it be possible, then, to create feature-rich touch-screen textbooks if the reader is under $100? I hope so. Insiders will be arguing back and forth about how the Kindle Fire will stack up against other tablets, but I would love to have one in my classroom. Or twenty. I have a gigantic book given to me by my wife a few birthdays ago. This gigantic book is the 2009 copy of The Writer’s Market. It tells writers where they can send novels for submission. Now I was reading the blogs the other day when I came across this story about author Amanda Hocking, who has been publishing her books directly to Amazon and onto Kindles everywhere. I know firsthand how the Kindle and eBooks in general act as a great equalizer. People can read any book they want without people judging them. Here is where teaching comes in, as well as my nefarious plan: Every year dozens of students produce short stories and novels, while very good, are not exactly marketable in my big book of publishers. I have two students I am thinking about right now who filled notebooks with stories. We could easily type those up, edit them, and, using Amazon’s handy five minute self-publishing site, get them on the market without any overhead cost. This would make a fantastic opportunity for my gifted and talented students who crave some way to get their words out. Combine couple of good high school students to edit and another few good art students for cover art, and you have quite the project! Granted, the royalty is something like $2 per book sold, but what better incentive is there for a young writer than getting a $10 check in the mail because people liked your book? I have a sneaking suspicion that more than a few copies will be bought by grandmothers. If only I could get some sort of finder’s fee … but I suppose for the sake of the profession I will probably have to offer the books for free or use them to help fund field trips.